This easy Dresden Plate quilt block pattern takes all of the fuss out of turning under the pointed blades of the plate. The pattern was written as a scrap quilt using reproduction fabrics from the early 20th Century but the blocks are just as lovely when sewn using any fabrics or a specific color scheme. This simple method produces neat and tidy Dresden Plate quilt blocks, every time. Dresden Plate quilt blocks finish at 12" x 12". Each Dresden Plate is made with 16 blades and one center circle. 1 square of background fabric that measures at least 13" x 13". It doesn't hurt to go a bit larger because applique distorts the background a bit and this piece will be trimmed back. Blocks are squared up to 12-1/2" x 12-1/2" after the Dresden Fan is in place. 1 fabric circle for the quilt block's center — see page 4 before cutting (it's fine to use a yo-yo at the block's center or adjust the center circle's size). Take 16 Dresden Plate blade patches to the ironing board and press flat. Fold a patch in half lengthwise, right sides together, matching edges carefully. Press the top couple of inches or so of the wider end of the folded fabric to create a crease along the patch's vertical midpoint. It's fine to press the entire patch if you prefer. Repeat for all patches. Sew a quarter inch seam from one edge to the other across the top end of all folded patches. Chain piecing makes this step a breeze. Remove from the machine and the clip chain pieced patches apart. Finger press seam allowances open where ends were sewn. Turn each patch's sewn end right-side-out. It usually just takes a finger to create a sharp point as you make the turn, but if necessary use a hera marker or other narrow-tipped object to push the point outward. Be careful not to push too hard or cut the fabric. Take the pieces back to the ironing board. From the reverse side, match the seam line of fabric extending below each point to the pre-pressed fold line and press again. This step centers the tip and ensures that all points have equal angles along their sides. When you're sure that points are centered, press again. Arrange 16 Dresden Plate blades into a circle next to your sewing machine, within easy reach. Do you like the layout? Shuffle the blades around until you're happy with their appearance. Grab the first two blades. Align the blades, right sides together, taking care to match the top points and side seams. Those are the areas of most importance for matching. If bottom edges are a tad longer or shorter than each other, don't worry about it, because they'll be covered later with the block's center circle. Note: If points don't match, take a blade back to the ironing board and fix its angles. Use a quarter inch seam allowance to sew the pair together along their sides, starting just inward at the top angled edges. Backstitch and then continue sewing until you've reached the end of the narrow aligned edges. Sew all remaining blades together with a quarter inch seam. Join the first and final blades in the same way. Press seam allowances open. Make a circle that finishes at 3" square — the inner line of the template. That line can be used for a couple of easy applique methods. Make a template from a file folder or other rigid material of the (3") finished size of the circle — the inner line. Draw a line around the template onto the wrong side of the fabric. Cut the fabric circle, leaving about a 1/4" seam allowance beyond the drawn line. Cut a piece of interfacing that's about the same size as the circle of fabric. Position the circle right side down on top of the interfacing. Sew a continuous seam around the drawn line, overlapping a bit where ends of the seams meet. Cut a slit in the interfacing and use the opening to turn the circle right side out. Use a blunt point such as a small screwdriver or hera marker to smooth the circle's seam. Press flat, making sure that edges around the circle are smooth, with no jagged areas. Some people use fusible interfacing for the method above and place the fusible side against the right side of the fabric. After sewing, making an opening and turning, the fusible side is on the back of the piece, which can be pressed in place before applique stitches are added around the edges. Use a 3" template for this method, too. Cut out a center circle and leave about 1/4" on all sides. Hand sew long basting stitches about 1/8" all the way around the edge of the circle. 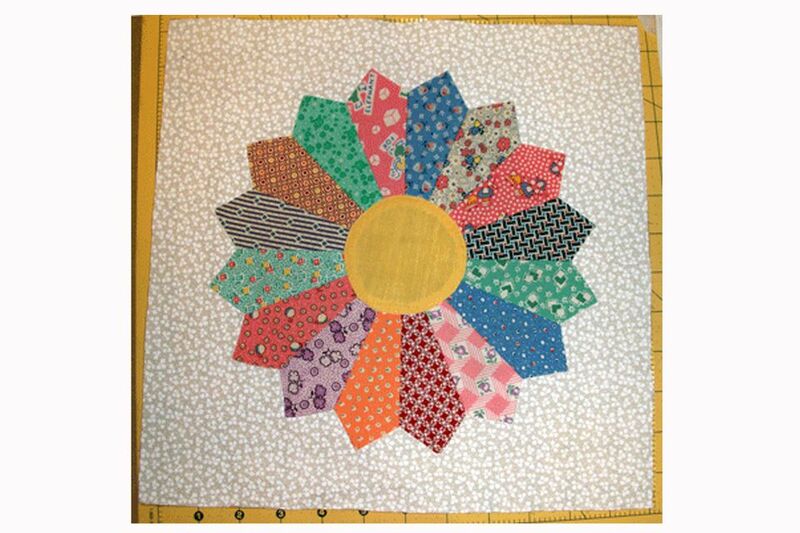 Place the 3" template in the center of the larger circle — against the wrong side of the fabric. Pull on the thread to draw the circles edges inward so that they touch the template. Press to set the shape and remove the template. Cardboard is best for this method because a plastic template could melt. See illustration. Cut a 3-1/2" fabric circle. Fold under the edge by about 1/4" as you sew the circle to the block, using a hand stitch and traditional needleturn applique. Photo and Dresden Plate block by Joy. Grab one of the large squares reserved for a Dresden Plate background. Fold the square in half one direction and press. Fold in the other direction and press. If you like, fold the square along its diagonals. Center the Dresden Plate on the circle, right side up, taking care to position it as close to the center as possible. The pressed lines will help you determine the center point. Pin in place. Place the round center at the center of the plate. Applique around the plate and the center circle using traditional needleturn or an invisible machine stitch. Use a decorative stitch if you prefer. Press. Square up the block to 12-1/2" x 12-1/2". Make sure the plate is centered within the background square before trimming. Some quilters like to remove the extra fabric from behind the applique. Take care to leave a portion of the background fabric in place and be careful not to cut into the top work.